Payson Officers: President Rhett Huff, 2nd VP Pat Hartzell, Treasurer Jim Hartzell, Tail Twister Extraordinaire Ned Deuel, Secretary Jennifer Huff and Membership Chair Steve Southwick. 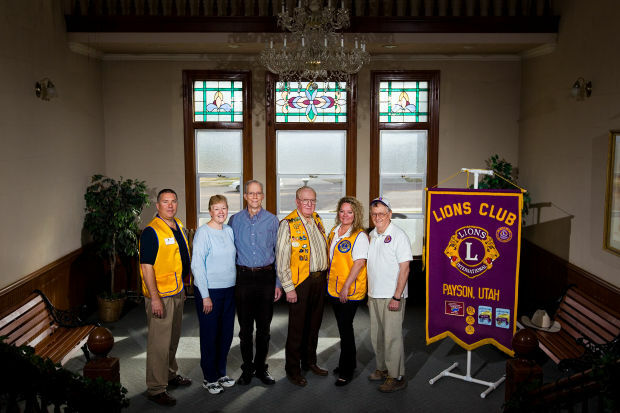 The Payson Lions are celebrating their 93rd year as the community's largest and oldest service organization. This year will be filled with events marking this huge milestone. See our calendar page to check for the latest. Along with that milestone, the worldwide organization, Lions Clubs International will be celebrating its 100th anniversary being the world's largest service organiation and a major force in making the world a better place to live. For the latest of what is going on with our group, click on the News/Events link above. Payson Lions meet twice monthly on the second and fourth Thursdays; visitors are welcome. If you would like information on the local group, call Steve Southwick at 801-822-1705. Check our calendar for a full list and description (where available) of meetings. We hope to see you there! You will have a "roaring" good time!